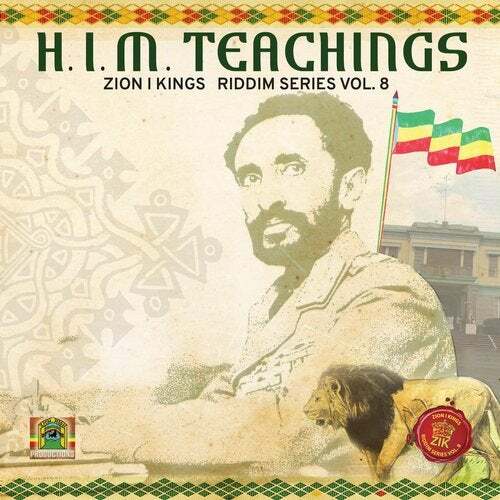 The rock solid Zion I KIngs Riddim Series continues with Vol. 8, H.I.M. Teachings Riddim.? This new edition from Zion High Productions features both established top shelf artists long associated with the Zion I Kings label family (Akae Beka, Lutan Fyah, Pressure, Lloyd Brown) and newcomers Amani Seearasta, from Brasil, and Jamaican Jahbari.? Arkaingelle, fresh from his hit 2016 album, Tru Da Fyah, and Marlon Asher, the "Ganja Farmer", also return with powerful vocals and lyrics. Musically, keyboardist Drew Keys provides a distinctive, hammering mallet effect that cascades throughout against JAH David's hand drumming on the kete driving the riddim's lively pulse.? ?Pressure's lead off track, "Uncomfortable" explores the danger laden, trouble zones of the urban ghetto landscape.? "Musical Warrior" from veteran Lloyd Brown is a tribute to the joys of positive musical collaboration.? Always lyrically agile Lutan Fyah testifies in "Test A Money" to the dire conditions brought on by debt based development policies.? Amani Seearasta makes his mark with "New Education" promoting positive tradition on the road to liberation and redemption.? "Improve" from Marlon Asher warns against chasing false dreams where dangers lurk.? On "Chieftess of Spices",the "Voice of Midnite", Akae Beka, endorses a worldwide Rastafari spiritual unity based on a common heritage.? Guyana-born Arkaingelle hits hard on "Chubble", a plea for simplicity in complicated times.? Jahbar I's "Powaz of Love" completes the vocal set imploring for righteousness in the face of evil.? A full-throttled dub mix finishes off the album in fine style.